Butch is a boy living in Los Angeles, and leading a gang of armed kids. 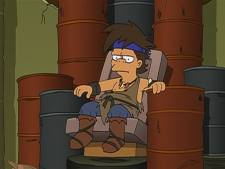 He encountered Fry and Michelle, who believed they were in a post-apocalyptic waste land, in 3002. Is Jewish, as is the rest of his gang. This page was last edited on 16 August 2017, at 11:27.